The New York Klezmer Series | Klezmer Concerts, Workshops, Jam Sessions, Dance Parties – Thursdays at Jalopy! The New York Klezmer Series (NYKS) has been presenting Klezmer Music and Yiddish Dance in New York City since 2010. 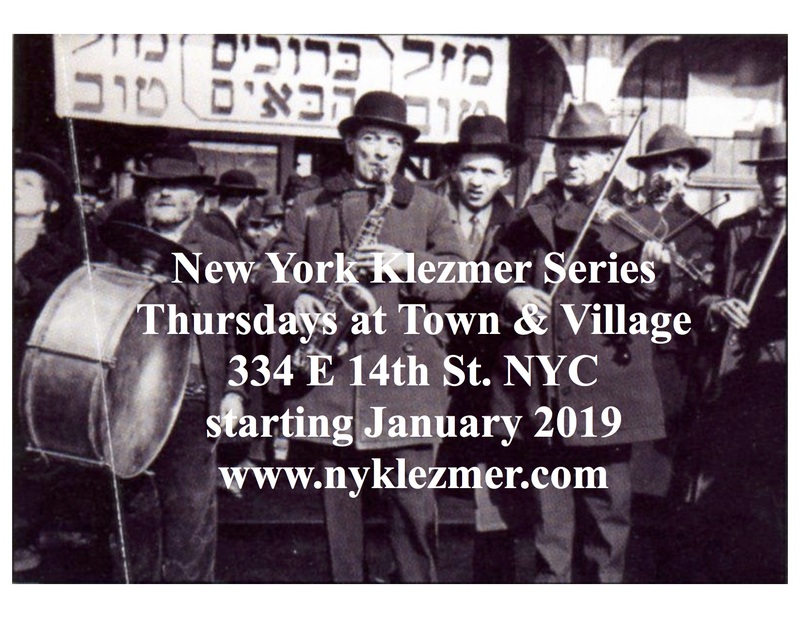 Originally The East Village Klezmer Series, we have occupied various spaces for our events, which consist of once a week Concerts, Workshops, Jam Sessions and monthly Dance Parties (Tantsheiser) with live Klezmer music. Beginning in January, 2019, we will be based at the wonderful Town & Village Synagogue’s Social Hall, at 334 E.14th St.!! Founded by Aaron Alexander and Rabbi Greg Wall, and inspired by the week-long Yiddish Culture events, Klez Kamp, Klez Kanada, YNY, and Trip to Yiddishland, the NY Klezmer Series aspires to present primarily Yiddish cultural offerings in an intimate & respectful setting and allow the artists freedom to present their own vision. What’s Klezmer? Klezmer music is the instrumental party music of the Jewish People from Eastern Europe – (Ashkenazim). It’s origins are in the 16th century, and it has evolved and assimilated local influences (Russian, Romanian, Ottoman, Hungarian etc.) wherever Ashkenazim have lived since. It is essentially Yiddish music – the instrumental music of people who spoke (and speak) Yiddish. It came to America with the immigration of Jews from Eastern Europe beginning in late 19th century, and has had a wonderful history in America, where it also assimilated American music traditions. Hasidic nigunim (wordless melodies), Yiddish theater music, Yiddish Swing and Yiddish folk song are all related and will be represented at the series. Tantsheiser (Dance Parties): Once a month or so we present a Tantshoyz – Yiddish dance party, with a Yiddish Dance specialist, and a professional dance band. Dance leaders have included Steve Weintraub, Michael Alpert, Zev Feldman, Avia Moore, Deborah Strauss, Eve Jochnowitz and Sarah Myerson. We have a Klezmer Instrumental Workshop every week that we have a concert, often led by the concert artists of the day, or by Artistic Director Aaron Alexander. This workshop has been running for over seven years and has developed a devoted following. We work on repertoire, style, form, ornamentation, groove, arranging and more. Often the participants have an opportunity to play the current pieces at the jam session after the concert, further deepening their understanding of new material. Concert artists have included: Frank London’s Klezmer Brass All-Stars, Alicia Svigals, The Tarras Band, Pete Sokolow’s “Klezmer Plus Trio”, Susan Leviton, Jordan Hirsch, Isaac Sadigursky, German Goldenshteyn Tribute Band w/Alex Kontorovich, Inna Barmash’s “Hindele”, Brian Glassman’s “Klezmer/Jazz Alliance”, Ichka & Siach HaSadeh from Montreal, Jordan Hirsch’s “Overnight Kugel”, Patrick Farrell, Elaine and Susan Hoffman-Watts, Michael Winograd, Yiddish Art Trio, Levitt Legacy Band, Strauss/Warschauer Duo, Jake Shulman-Ment, Margot Leverett & Klezmer Mountain Boys, Eve Sicular’s “Metropolitan Klezmer”, Christian Dawid, Zev Zions, Arkady Goldenshteyn, Benjy Fox-Rosen, Lisa n Sruli Family Band, Aaron Alexander’s Midrash Mish Mosh & The Klez Messengers, Dmitri Slepovitch & “Litvakus”, Levitt Legacy Band, The Rubin-Rushefsky-Greenman Trio (R2G), Lorin Sklamberg & David Ashkenazy, Klezmerfest with Greg Wall, Ezekiel’s Wheels (from Boston), Eleanor Reissa, Roger Davidson and Frank London, Mike Cohen Band, Breslev Bar Band, Polina Shepherd, Lauren Brody, Jake Shulman-Ment, Zev Feldman, Dena Ressler’s T-Klez, and many others. We have been based in several different spaces over the years, including Sixth St. Community Synagogue, Stephen Wise Free Synagogue, Mehanata, Zeb’s Place, Jalopy Theater, Funky Joe’s and our current home: Town & Village Synagogue. Support for the NY Klezmer Series is provided by public funds from the New York State Council on the Arts, a State Agency in partnership with Governor Andrew Cuomo.